I provide executive influence coaching services to CEOs, CMOs, and entrepreneurs at companies with at least $5M in annual revenue. No matter the channel, I assist executives to refine their own brand, find their ideal audience, and connect with that audience through compelling content that prompts action leading to the fulfillment of my client’s objectives. If you’re an executive and you want to become a well-known influencer and thought leader, that’s the type of coaching I focus on. I can divide the 20 years I’ve been a CEO into two parts; before I discovered the power of a personal brand, and after. Before I created a personal brand and invested in thought leadership I was able to recruit great people, but sometimes missed out on the greatest talent. My business grew, but not as fast as I knew it could. My impact seemed to be limited to those I knew personally. In 2013 I began writing for Forbes, then gave a TEDx talk, then published a book, and began to do interviews on TV, radio, and podcasts. I found it easier to hire the best, my business grew, and I’ve been able to impact hundreds of thousands with my message. Now I help CEOs of companies with at least $5M in revenue to do what I’ve done. 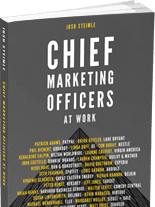 I’m not a CMO, although I’m sometimes mistaken for one because of my work as the author of Chief Marketing Officers at Work, for which I interviewed 30 CMOs from companies like Target, PayPal, Spotify, The Home Depot, and GE. I’ve also published scores of articles on the CMO role as a columnist for Forbes, CMO.com, and other publications. Since 1999, as a marketing agency founder and CEO I’ve worked with thousands of marketers at all levels. I’ve combined my knowledge of marketing, the CMO role, and personal branding and thought leadership to coach CMOs on how to become more influential. I started my marketing agency in 1999. In 2013 we almost went out of business, but today we’re a growing, multi-million dollar agency with offices in the US, UK, Hong Kong, and China. What turned things around? It started with building my personal brand. Now I’m helping other agency owners do the same thing for themselves. What if you’re neither a CEO, CMO, or marketing agency owner? If, despite my stated areas of focus above, you still want to work with me, I will make the occasional exception if there is a particularly good fit. In addition to working with CEOs, CMOs, and agency owners I have also coached venture capitalists, professors, working professionals, and various types of entrepreneurs.